All praise be to God alone, and may His peace and blessings be upon His messenger and bondman our Prophet Muhammad, his family and his companions. Perform your prayers in the same manner you had seen me doing. 0 ye who believe, when ye prepare for prayer, wash your faces and your hands (and arms) to the elbows, rub your heads(with water) and (wash) your feet to the ankles. Prayer without ablution is invalid. To view a series of photographs detailing the performance of wuduu click HERE. 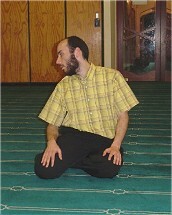 2 To turn one's face and whole body towards the Ka'aba, The Holy House at Mak-kah, intending by heart to perform the prayer which s/he wants to fulfil, whether it is an obligatory prayer or a supererogatory prayer, the worshipper in all cases, should not pronounce his/her intention openly, because neither the Prophet nor his companions used to utter the intention for prayer. Thus, pronouncing the intention for prayer in audible voice is a heresy and an illicit action. Whether the individual be an Imam or performs his/her prayer individually, s/he should make (A Sutra) i.e. a curtain for his/her prayer. 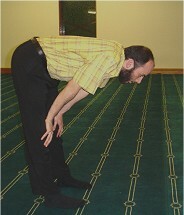 Directing the face towards the Qibla (The Ka'aba at Makkah) is an imperative condition for every prayer. However, there are few exceptions for this rule explained in authoritative books for whom who wish to refer. 3 To pronounce Takbirat Al-lhram that is to say "Allahu Akbar" celebrating by that the greatness of God and looking meanwhile, downwards to the place where s/he will prostrate. 4 To raise one's hands up to the level of the shoulders or near to the lobes of his/her ears, while pronouncing Takbirat Al-lhram. For a picture click HERE. 5 To put one's right hand over his/her left hand and left wrist, and put them both over his/her chest, as the Prophet (peace and blessings of God be upon him) used to do. "Allahumma baid bayni wa bayena khatayaya kawa baadta bayena al-mashriki wal maghribi, Allahumma naqqiniy min khatayaya kama yonaqa al thawbo alabyado min aldans. Allahumma igysilniy min khatayaya bilmai wathalgi walbarad". "0 God, separate me from my sins as You have separated the east and west. 0 God, cleanse we of my sins as the white rope is cleansed from dirt. 0 God, wash off my sins with water, snow and hail". "Sobhanaka Allahumma wa bihawdika watabaraka Ismoka wata'la jaddoka wala ilaha ghayroka"
"Praise and glory be to God. Blessed be Your Name, exalted be Your Majesty and Glory. There is no god but You". Or s/he may say any other supplications which the Prophet, (peace and blessings of God be on him) used to say in his prayers. It is better to recite these supplications alternately, the first one in the morning prayer Fajr, the second in the noon prayer Zuhr, each one by turn, in conformity with what the Prophet used to do. "I seek protection of God against the accursed Satan". "In the name of God, the All Merciful, the All Compassionate". "Prayer without reciting the Fatiha is invalid". The worshipper should say "A'meen" after reciting the Fatiha loudly if the prayer is said loudly, and whisper it in inaudible prayers. To be in conformity with the traditions of the Prophet, the worshipper is advised to recite verses from medium size Suras of the Qur'an in the Zuhr (noon), Asr (late afternoon), and Isha (night) prayers. As for the Fajr (morning) prayer, the worshipper is advised to recite a passage from the long Suras of the Qur'an. S/he has the choice in Maghrib prayer (Evening prayer) either to recite passages from the long Suras or from the short Suras of the Qur'an. "Glory be to my Lord, the Almighty". "Subhanak-Allahumma Rabbana wa bi hamdika, Allahumma Ighfir liy"
"Glory be to Thee, 0 God, and I praise Thee,forgive me my sins"
8 To raise one's head up from bowing, raising one's hands to the level of his/her shoulders or ears, saying, in case of being Imam or praying alone: For a picture click HERE. "God listens to him who praises Him"
"Rabbana wa laka al hamdu hamdan ka-theera'n tayyiban mobarakan feehiy mil 'a ssamawati wa mila alardhi wa mil'a ma bay-nahoma wa mila ma Shita min shiyin ba'ad"
"Our Lord, praise be fore Thee only, praises plentiful and blessed as to fill the heavens, the earth, what in between, and fill that which will please Thee besides them". "You God who deserve all praises and all glory, your praising is the best and most true of whatever Your servant can say, we all are Your servants. Our Lord, no one can ever deprive aught of what You have bestowed and no one can ever give aught of what You have deprived"
The worshipper is advised to put his/her hands on his/her chest, as s/he had done before s/he bowed. Both Wa'il Ibn Haggar and Sahl Ibn Sai'yd reported that this was the manner of the Prophet when he used to raise his head up after bowing. "Glorified is my Lord, the Exalted"
"Subhanaka Allahuma Rabbana wa bi hamdika, Allahuma lghfir-liy". "Glory be to Thee, Our Lord, and I praise Thee. Our Lord, forgive me my sins". "As for bowing Ruku you should glorify your Lord during performing it, as for prostration, you should do your best to supplicate and ask for more from Him, because your supplications during prostration are more worthy to be accepted". The worshipper should ask his/her Lord for prosperity both in this worldly life and in the Hereafter. Whether it is an obligatory prayer or an optional prayer, the worshipper, while prostrating, should neither bring his/her hands close to his/her sides, nor stick his/her abdomen to his/her thighs, or his/her thighs to his/her legs. 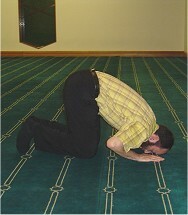 The worshipper's arms should be raised up from the ground because the Prophet, may peace and blessings of God be on him, prohibited putting the arms and stretching them on the ground, ordering that "adjust your prostration, keep straight in it, and stretch not your hands on the ground as dogs do". "0 my Lord, forgive me, have mercy on me, guide me, provide me with your blessings and console me ". The worshipper should feel tranquillity during this pause. "Allahu Akbar" "God is Great" and repeating during his/her prostration what s/he did and said in the first prostration. 13 If the prayer consists of two Rakaat (two units of prayer) as the morning prayer "Fajr", Feast prayer "Eid", or the Friday prayer "Jumu'a", the worshipper sits after the second prostration, with his/her right foot erect, sitting on his/her left foot laid down, putting his right hand on his right thigh, all his/her fingers close-fisted save the index finger which s/he uses to point out as a sign for his/her monotheistic belief, and his/her left hand is put on his/her left thigh. For a picture click HERE. There is nothing in the way, if the worshipper keeps both the little and ring fingers closed, while rounding his/her thumb and middle finger in a ring-shape, and uses his/her index finger to point out as a sign for his/her monotheistic belief. It has been related that the Prophet, may peace and blessings of God be on him, had practised both of these ways, thus, it is advisable for the worshipper to perform the first way once and the other on the second time. "Attahiyatu lilahi wasalawatu watayyibatu Assalamu alaika ayuhan nabiyu wa rahmatu llahi wa barakatuhu. Assalamu alayina wa ala ibadil lahis salalihiyn. Ashadu ala ilaha ila lahu wa ashadu anna Muhammadan abdoho wa raswuloh. Allahuma salli 'ala Muhammad wa 'ala aali Muhamad, kama salayata 'ala Ibrahima wa 'ala ali Ibrahima. Innaka Hamidum Majid. Alahumma barik 'ala Mohammad wa 'ala aali Muhammad kama baarakta 'ala Ibrahima wa 'ala aali Ibrahima. Innaka Hamidum Majid." "Greetings, prayers and the good things of life belong to God. Peace, mercy and blessing of God be on you, 0 Prophet, May peace be upon us and on the devout slaves of God. I testify that there is no god but God and I testify that Muhammad is His slave and messenger. 0 God, bless Muhammad and his family as You blessed Ibrahim and his family. You are the Most-Praised, The Most-glorious. 0 God, bestow Your grace on Muhammad and his family as You bestowed it on lbrahim and his family. You are the Most-Praised, The Most-glorious." "As-salamu alai kum wa rahmatu Allah" and to the left saying this salutation which means "Peace and mercy of God be on you." 14 In the case of a three Rakaat prayer (prayer consisting of three units) as that of Maghrib prayer, (evening prayer), or a four-Rakaat prayer like that of noon prayer (Zuhr), Asr prayer (late afternoon prayer) or, Isha prayer (night prayer), the worshipper stands up after reciting the Tashahud according to the manner stated before, and raises his/her hands up to the level of his/her shoulders saying (Allahu Akbar). 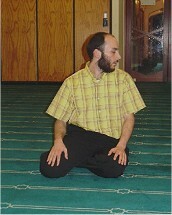 The worshipper puts his/her hands over his/her chest as it had been explained before, and recites only the Fatiha. 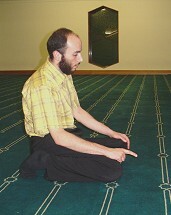 There is no objection if s/he adds to the Fatiha some other verses of the Qur'an while performing the third or fourth Rakaat (units of prayer) of noon prayer (Zuhr), because this was stated to be one of the manners adopted by the Prophet, may peace and blessings of God be on him, according to the tradition reported by Abi Saied. while turning first to the right, for a picture click HERE , and second to the left, for a picture click HERE, as it has been explained before. "0 God, Thou art peace and from Thee is peace. Thou art blessed, 0 possessor of Glory and Honour." "There is no god but God. He is the One. He has no partner. His is the dominion and to Him alone is the praise. He has power over all things. 0 Lord, none may withhold what You have given and none may give what You have withheld and the riches cannot avail a wealthy person with Thee. There is no might or power except by the support of God, There is no god but God and we do not worship but Him alone. To Him alone belong all bounties, to Him alone belong all grace, and to Him worthy praise is accorded. There is no god but God, to Whom we are sincere in devotion, even though the unbelievers may detest it." "There is no god but God. He is the One. He has no partner. His is the dominion and to Him alone is the praise. He has power over all things." The worshipper adds to that the recitation of the verse of the Throne "Ayat Al-Kursiy", Surat Al-Ikhlas, Surat El-Falaq and Surat Al-Nas. It is recommendable to recite these Suras thrice after the Fajr prayer (Morning prayer), and the Maghrib prayer (evening prayer) because this was reported to be one of the traditions of the Prophet, peace and blessings of God be on him. As it had been stated before, all these after-prayer supplications are optional and not obligatory. Every Muslim, whether be male or female, is recommended to pray 12 Rakaat of supererogatory prayers every day: four of these Rakaat (units of prayers) are before noon prayer, two after it, two after Maghrib prayer, two after Isha (night) prayer and two before the morning prayer. These supererogatory prayers are called (Rawatib) which means: "Certain supererogatory exercises of optional prayers." The Prophet peace and blessings of God be on him, preserved the performance of these optional prayers wherever he settled. During his travels, he used to practice the two optional Rakaat before the morning prayer and also the Witr prayer (after the Isha prayer). 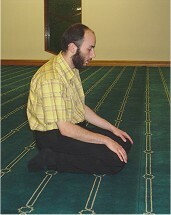 There is no objection to perform these optional prayers in the mosque, but it is better to perform it at home, because the Prophet, peace and blessings of God be on him, said "The best of the prayers are those which are fulfilled at one's own home, with exception to obligatory prayers which should be performed in congregation at the mosque." "Whoever prays optionally twelve Rakaat every one day and night, God will reward him by an established dwelling in the paradise." Ye have indeed in the Messenger of God an excellent exemplar"
Perform your prayer in the same manner as you had seen me doing. God is He Who is Able to render us success and prosperity and may God give His blessings and peace to our Prophet Muhammad son of Abdellah, his family, his companions and whoever follows his way till doomsday. Supreme Head Office for Religious Researches, Ifta, Call and Guidance Departments. Photographs courtesy of the Muslim Association of Canterbury (MAC). This page last updated 26/11/2009 2:04:16 p.m. PLEASE NOTE: The revealed Arabic Qur'an is the authoritative and primary source of reference and as such the Qur'anic English translations are provided purely as indicative interpretations. This Site Designed & Built By FrogWrite Creations P.O. Box 40, Greytown 5742, New Zealand. Site design and scripting is copyright © FrogWrite Creations 2009-2019 with the exception of the ticker and responsive lightbox which are provided free of charge by Dynamicdrive.com.